The Goldenrod Showboat took on about 7 feet of water when the Illinois River flooded near Kampsville, Illinois, in early May. Illinois River floodwater has drained from the hull of the Goldenrod Showboat, along with any lingering optimism that the century-old vessel can be saved, according to the preservation group that owns it. On May 8, Medford posted on Facebook that the Goldenrod was taking on water after the swollen river flooded the bank where the historic vessel has been sitting for years, near Kampsville, Illinois, about 80 miles north of St. Louis. The Goldenrod — once a fixture on the St. Louis riverfront — took on about 7 feet of water, partially flooding its interior, including the theater, he said. This latest setback ends a last-ditch effort to disassemble and rebuild the vessel on land. “We’ve reached the end of life,’’ he said, glumly. The dock owners are pressing to have the landmark removed from their property, Medford said, adding that he doesn’t know when or how that will happen. The dock owners won the Goldenrod in a foreclosure action, but donated it to the preservation association last year to avoid the cost of salvaging or burning the structure. That action was a surprise, coming six months after the preservation group bid the landmark a final farewell. For months, they had been salvaging artifacts that they still hope to display in local museums. They are storing chandeliers and gilded mirrors, furnishings and photographs. The pilothouse was also removed from the vessel, leaving the aged and weathered landmark a shell of its former self. Salvaging artifacts was Plan B for the group, which abandoned its original goal — to refurbish the Goldenrod and return it to the St. Louis riverfront — after the vessel suffered irreparable damage in August 2015 during another bout with the flooding Illinois River. For 50 years, the Goldenrod Showboat was a fixture on the St. Louis riverfront, where it hosted lively ragtime and jazz festivals and campy vaudeville productions. It was moved to St. Charles in 1989 where it operated as a dinner theater. But in recent years, it’s been parked at Kampsville, where a crew of volunteers too young to have seen the showboat in its heyday took up its cause. The preservation group, which worked for years to preserve the Goldenrod, has always had the will, but not the money, Medford said. It would have cost about $3 million to make the showboat river worthy. He believes the group has salvaged enough artifacts to continue the spirit of the Goldenrod. 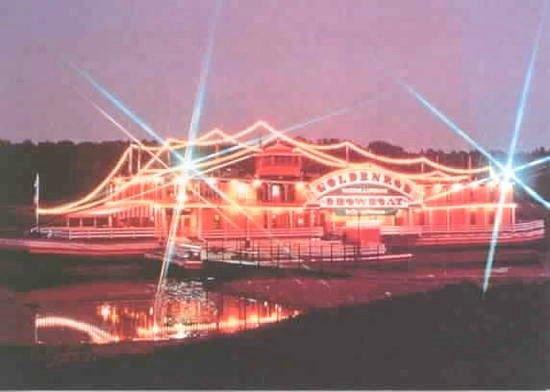 Volunteers will gather on Thursday at a remote spot on the Illinois River to say their final farewells to the Goldenrod Showboat, a St. Louis landmark they worked relentlessly to preserve. 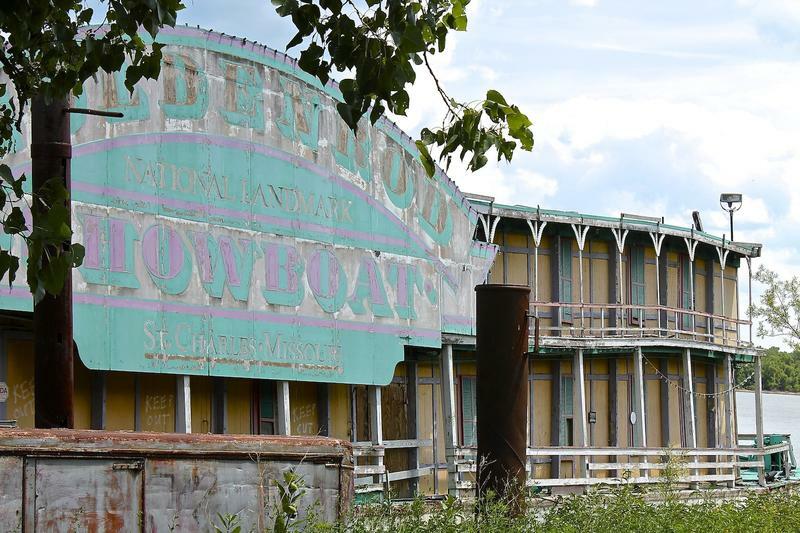 The century-old showboat suffered irreparable damage last summer during efforts to save it from the flooding river. Since then, volunteers have worked on weekends to remove artifacts -- chandeliers and gilded mirrors, furnishings and photographs -- for future display in museums. This article originally appeared in the St. Louis Beacon. - The Goldenrod Showboat, a historic vessel that delivered lively theater and music to Midwestern river towns in the early 20th century, now waits at an Illinois river bank for salvation -- or the salvage yard. Though the clock is ticking, a small nonprofit group has renewed efforts to save the grand old vessel and return it to the St. Louis riverfront. The gloom of the skies over the Illinois River matched the mood aboard the historic Goldenrod Showboat Wednesday afternoon, as one of her loyal guardians ushered reporters and photographers around the creaky vessel for one last photo op. Can This Floating Landmark From St. Louis' Riverfront Be Saved? 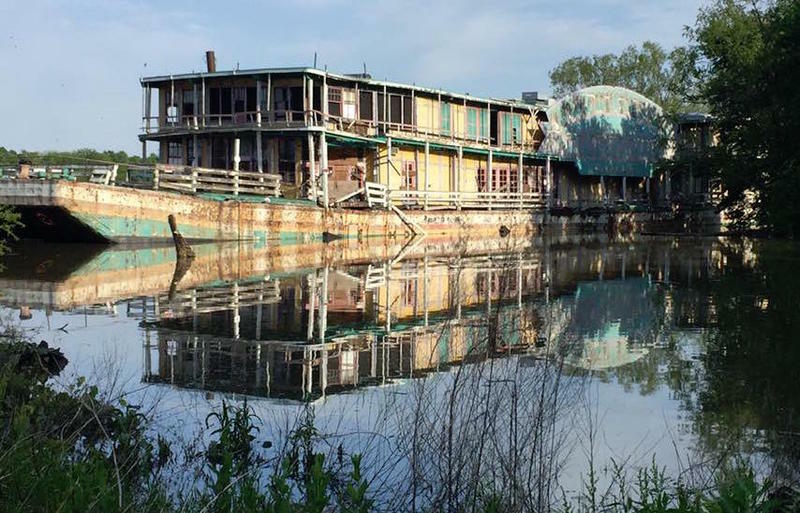 The century-old Goldenrod Showboat is still in limbo, waiting along an empty stretch of the Illinois River like a forgotten star from yesteryear yearning for one more curtain call. The Goldenrod is moored out of sight -- hidden by weeds and brush in a remote spot along Highway 100, north of Kampsville, Ill. But she’s not been forgotten. A small band of diehard fans say they are determined to rescue and return the vessel to the St. Louis riverfront where she spent half her life.